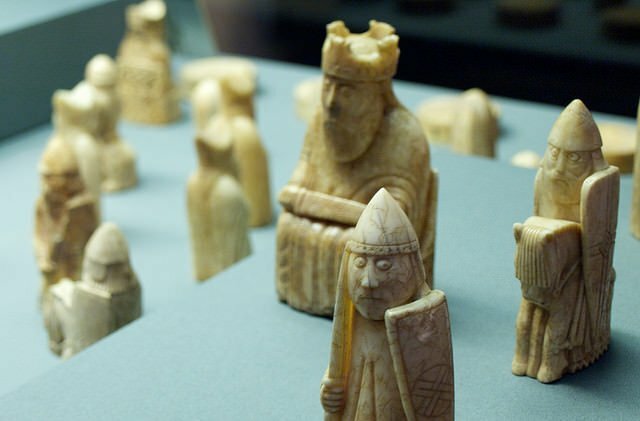 Introduction: The purpose of this interdisciplinary paper is to reopen discussions on the hoard of gaming pieces from Uig, Isle of Lewis (Western Isles: the Outer Hebrides), commonly known as the Lewis chessmen. Found in 1831, they are probably the most well-known archaeological find from Scotland. There are 93 pieces, including 78 chessmen, 14 tables-men and a buckle. With the exception of 11 chessmen in the National Museums Scotland, all the pieces are in the British Museum. The figurative pieces (‘face pieces’), the main concern of this paper, are illustrated in Figures 1–8, the captions for which all follow the formula of piece-type and its number, height, group and set. We have used the two museums’ numbering systems for the pieces: pieces 19–29 are in NMS, and those numbered from 78 onwards are in the British Museum. We explain group and set later. Many see the pieces as icons of Scandinavian and Romanesque art, recognised throughout the world as archetypal chessmen. A ground-breaking and still important report on the pieces acquired by the BM was released by Frederic Madden a year after their discovery, and since then they have been well published and illustrated in numerous works of scholarship. The commonly held name, chessmen, fixed in both academic circles and popular culture, is in many ways apt but in reality is a rather limiting appellation for the diversity of material in the hoard (detailed discussion rarely also extends to the tables-men and the buckle). As we will argue below, the kings and pawns might also have been used to play hnefatafl, another board game popular in the Scandinavian world.